I mean, really. 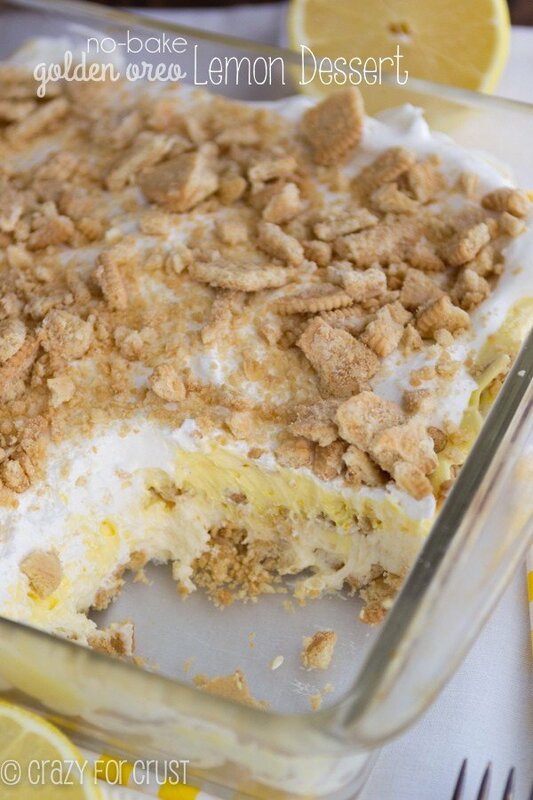 No-Bake layered lush desserts are probably one of the best things ever. They’re amazing in summer when it’s too hot to cook – but they’re a great party dish all year round, which is why I’ve been itching to make one with pumpkin! Make a no-bake pumpkin dessert to have your fall flavors while it’s still hot outside! As you can probably imagine, I do a lot of grocery shopping. I do a big shopping once every week and I still often have to stop once or twice for things I forgot (or just realized I needed because I wasn’t planning to make two banana bundt cakes to make them perfect or I needed butterscotch pudding cookies right this second and have no pudding mix). Sometimes I wonder what the cashier thinks of me when I unload an entire cart full of groceries onto the conveyer belt. Often I’m buying several sacks of sugar and flour and four different kinds of M&M’s alongside a weeks’ worth of produce. Or I have Jordan with me and they wonder where my other 5 kids are because I’m spending $200 on groceries. Or they wonder why I need 5 cans of pumpkin in July. This No-Bake Pumpkin Dessert is in the style of a lush or a lasagna dessert. I never quite know what to call them, so I just stick with “dessert” like I did for my lemon and mocha mud pie versions. 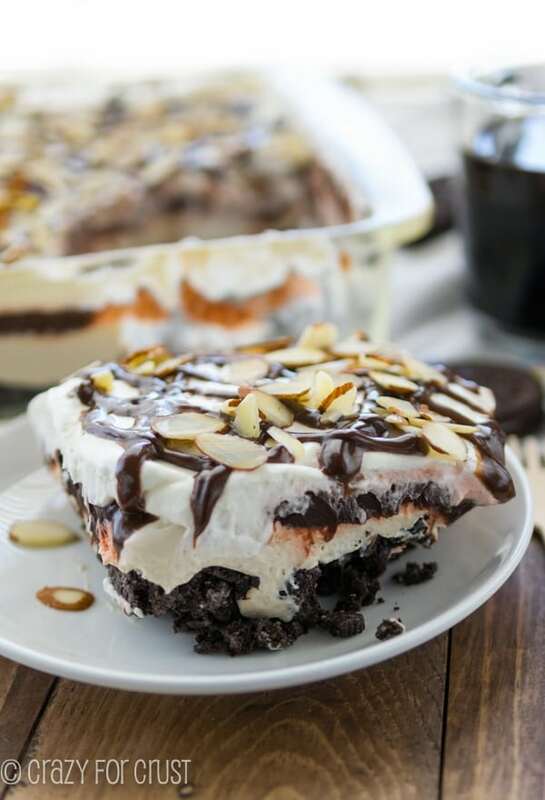 A lush or no-bake dessert is created by layering a crust with two or three different flavors that are a pudding consistency. I make mine in a 9×9″ baking dish and I always make in when I know I have people coming over. 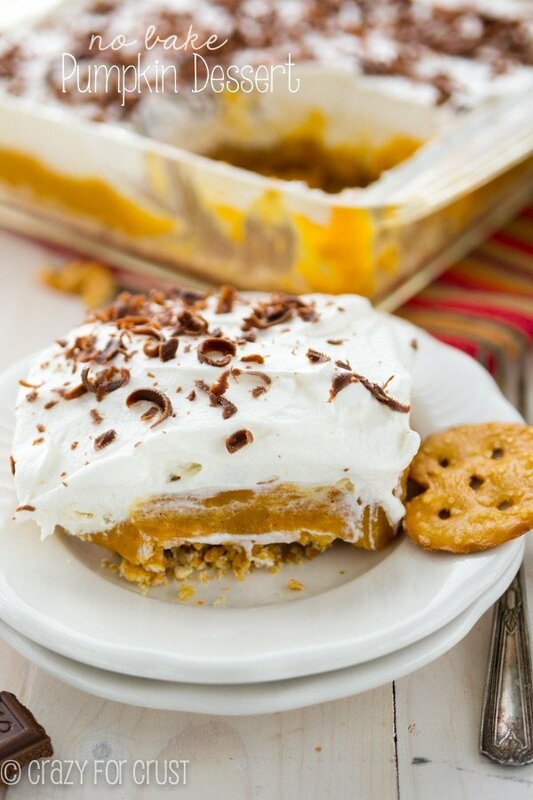 This pumpkin dessert has four layers of fabulousness: crust, pumpkin, cheesecake, and whipped topping with chocolate shavings. You’d eat the entire thing too, wouldn’t you? How do you make a fabulous no-bake pumpkin dessert? My crust is made of Rold Gold® Original Pretzel Thins. 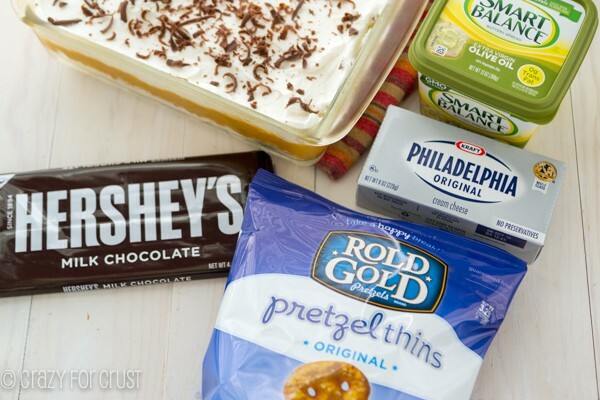 I love pretzel thins – they’re our favorite snack and I always have them in the pantry. The crust needs a binder, which is usually butter, but for this recipe I used Smart Balance Spread with EVOO. 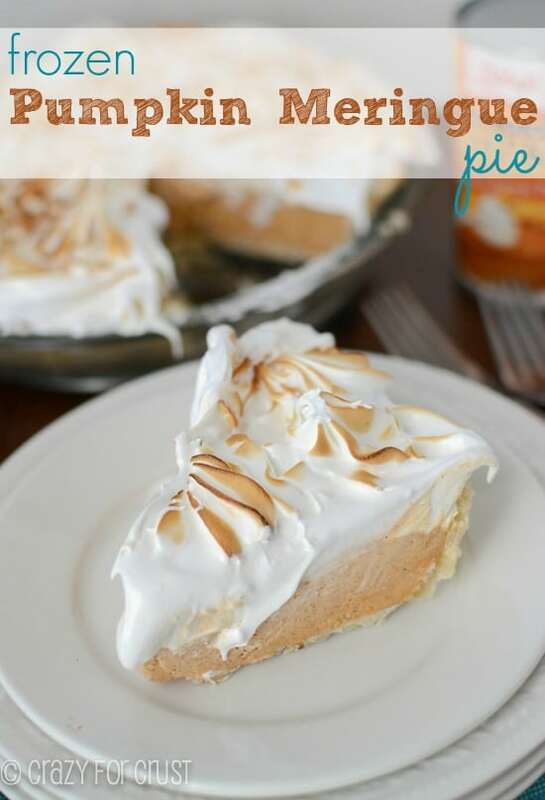 The crust isn’t a solid crust like a pie crust is; it’s looser and adds good texture to the dessert. In fact, the pretzels soften up just a touch and it ends up tasting like you’re eating pumpkin pie! The pumpkin layer is made with pumpkin puree, pumpkin pie spice, and vanilla pudding mix. It layers nicely on top of the pretzel crust. I had a feeling pumpkin + pretzel would be amazing together, and I was right. Safeway is one of those stores I love to walk into. I know that I’m going to get great lunch meat from the deli, the produce is going to be fresh (and last! ), and I know I’m going to save money because I always use my Just4U savings. And with all the shopping I do, I really, really need lots of savings! This no bake pumpkin dessert was seriously my favorite lush to date. The pumpkin and cheesecake layers go well, obviously, because those two flavors are total BFFs. The pretzel adds a texture and a flavor to the pumpkin you didn’t realize would go so well, and the chocolate is the perfect garnish. It’s an especially great pumpkin dessert for Sacramento in August, because it’s still over 90 degrees. It’s going to be that way until October, so this way I can enjoy my pumpkin without the added A/C bill. But you can believe I’ll be serving this at Thanksgiving too. 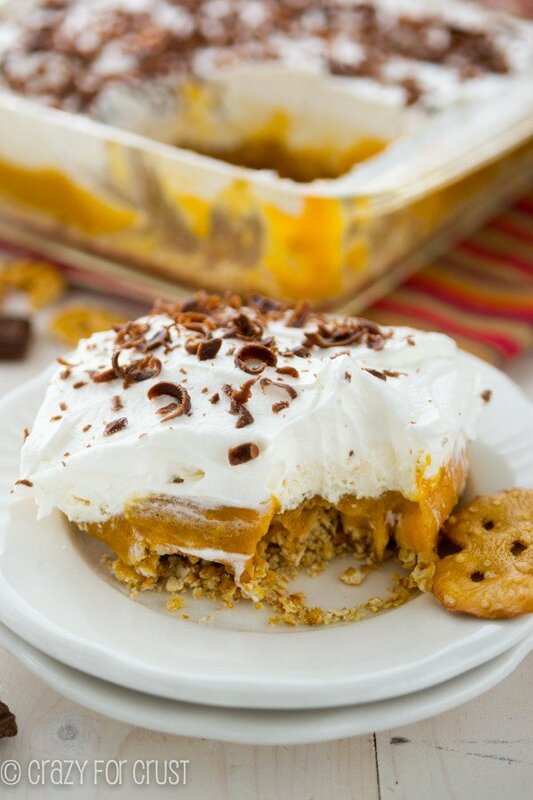 No Bake Pumpkin Lush Dessert: the new pumpkin pie! Just make it. Believe me – you’re gonna love it! 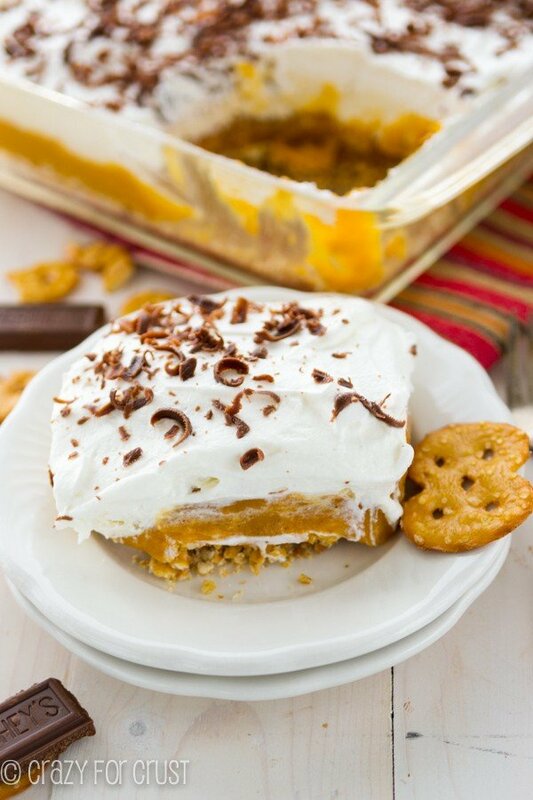 Easy to make, this no-bake pumpkin dessert has 4 layers of fabulous flavor! Place the crushed pretzels in a large bowl. You want them coarsely crushed, not fine crumbs. Stir in 2 tablespoons of sugar and then work in the butter until no big chunks are left. You may need to use your hands for this step. Place in the bottom of a 9x9” baking dish. Chill until ready to use. Wipe out the crust bowl, then add the pudding mix to the bowl. Add the milk and whisk until smooth. Add the pumpkin puree and pumpkin pie spice and mix until smooth. Carefully pour and spread over the crust. The crust isn’t solid, so you need to be careful it doesn’t get mixed into the pumpkin layer. Place the cream cheese in the bowl and beat with a hand mixer until smooth. Add 1/2 cup sugar and vanilla and beat until combined. Fold in half of the whipped topping. Spread over pumpkin layer. This post was sponsored by Safeway, but opinions are 100% mine. I really do love Safeway and I shop there almost every week! And seriously. Sign up for Just4U. It’ll change the way you shop!